Geographica LTD is private consultancy company located in Bulgaria. The company provides state-of-the-art services and complete solutions in the field of regional, spatial and environmental planning and management. The services also include Geographic Information Systems (GIS) and Spatial Decision Support Systems. Our job was to create a logo design that is suitable for the company’s needs. It had to be linked to their name and the services being provided. This is our logo solution – a nice logotype with focus on the geographical aspect, represented with a globe. 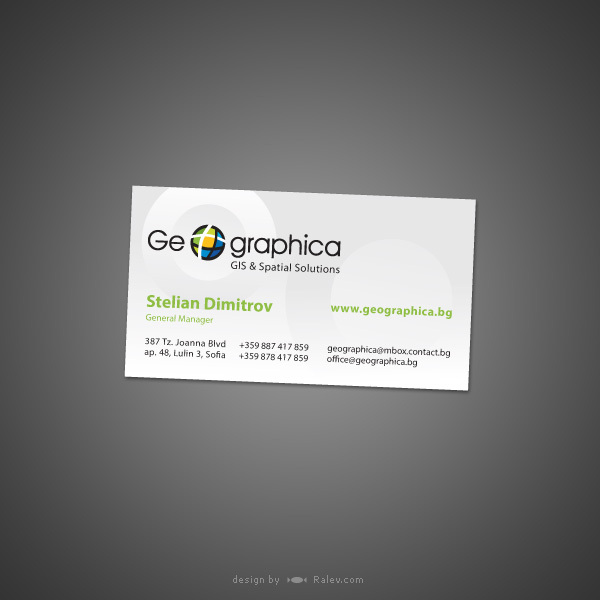 Our business card design for the company. The lack of many colors give a more serious touch to the card, but a warm green color is always nice to include.